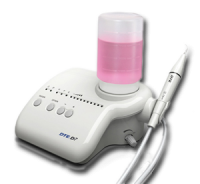 Categories › Small Equipment & Handpieces › Ultrasonic Scalers › DTE D7 Ultrasonic piezo scaler with detachable handpiece. DTE D7 Ultrasonic piezo scaler with detachable handpiece. Ultrasonic piezo scaler with detachable handpiece. Four functions: scaling, perio, endo and auto-water supply. Built-in 350ml capacity water container with an auto-water supply. Adaptor for external purified water source and a spare bottle. The handpiece is detachable and can be autoclaved at a temperature of 135℃ and pressure of 0.22MPa. Control by PC ensures easy operation and allows for more efficient scaling. Incl. 7 tips, torque wrench, tip holder and spare bottle.